Although it was created with the purpose of being a fast and filling alternative for people who do not have the time to sit down for a full meal during the day, street food has really come into its own. There is the same level of expectation from street food as there is from classy restaurants. Therefore, knowing something about each type of dish might come in handy. Let’s take shawarma and gyros, for example. Do you know the difference between them? 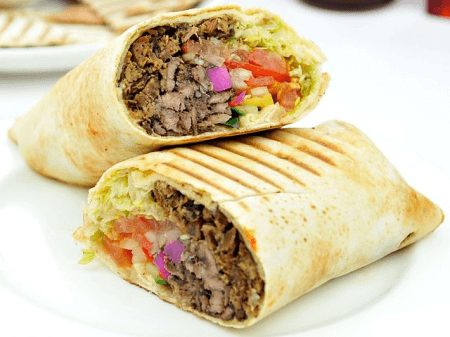 Shawarma is an Arabic dish served as street food or in bistros and ethnic restaurants all over the world. It is particularly popular in Arab and Balcanic countries. It is made with meat, lamb, chicken, turkey, veal, beef, or a combination of meats. The meat is grilled on a turning spit then shredded and served on a plate, in a wrap, or in a sandwich. Among the most common toppings used are tabbouleh, fattoush, and hummus. Dressings vary from amba (pickled mango with chili) or tahini (sesame sauce). Cardamom, cinnamon, and nutmeg are among the spices used for this dish. A Gyro is a Greek dish served as street or bistro food. It is traditionally made with pork or chicken, and with veal, beef, or lamb outside of Greece. The meat is usually ground and spiced with salt, paprika, pepper, parsley, dried garlic, thyme, rosemary, marjoram, and oregano. It is then placed on a spit and slow-cooked in its own fat as the spit turns. If the meat does not contain enough fat for this, layers of fat may be added. 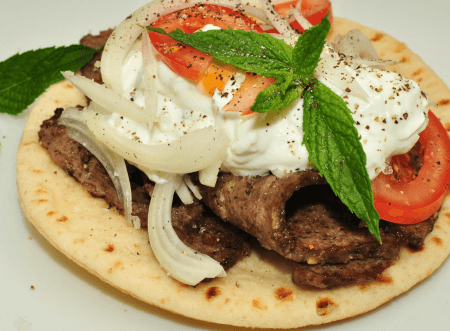 The meat is usually eaten in a piece of pita with tzatziki sauce, tomato, and onions. So what is the difference between shawarma and a gyro? These two dishes look the same and they have the same origin, the Turkish Doner Kebab. However, they are two local takes on the 18th-century Turkish dish. Therefore, the Arabs called it “shawarma” and the Greeks called it “gyro,” both terms coming from the verb “to turn.” This is a reference to the turning motion of the meat on the spit. Greeks prefer to use chicken and pork, although lamb, veal, and beef are used as well. Arabs chose chicken, turkey, lamb, beef, and combinations of these meats. The spices used also differ as they both correspond to their own regions. Shawarma has cardamom, cinnamon, and nutmeg. Gyros, on the other hand, have parsley, oregano, paprika, parsley, dried garlic, onions, thyme, marjoram, and rosemary. Shawarma is served on a plate, in a wrap, or in a sandwich. Traditionally, a gyro is served on pita bread (Greek flatbread). Specific Arab salads like tabbouleh and fattoush, and toppings such as tahini and amba complement the meat of a shawarma. A gyro, however, is served with tzatziki, tomatoes, and onions.